I was listening to the songs of Vinnaithaandi Varuvaayaa these days and when first time listening to this album I was little disappointed that lyrics can’t understood and felt like something strange. For me what attract first are the lyrics more than the music in a song and so thought I should have not brought this album instead downloading, but later listening for sometime the music and short-sweet words impressed me slowly. Even thus there’s some disappointment over lyrics and the pictures shows it’s a soft and romancing movie, the songs aren’t handful to stimulate, except the amazing music perform by A.R.Rahman. Mannipaaya… is a caress to lost souls in sorrow and love; and the four couplets from Thirukkural is ingredient to sense and I realize the familiar in these lines later listening carfuls and those are the lines quite completes. The other two songs that impressed me a lot are Anbil Avan and Hosanna. The both has something magic wander through music and few lines; and carries some spirit to stimulate sense and love, and in all Hosanna is the solitude I listen often solely. Hosanna – an expression of praise, is simple expressive and thus its impressive. In this western style of music, I find something soothing while it goes on rhyming and English wording. Hosanna will always be praised for this soothing expression of peace and love. Hosanna, I love you so…. Its love that is hosanna true. Hosanna... Be there when you’re calling out my name Hosanna! Meaning of my whole life has changed! A pretty flower from the sensitive plant or touch me not. 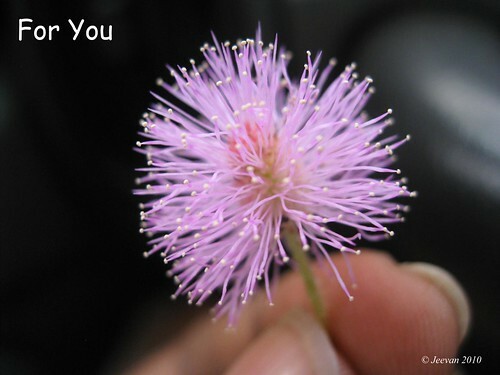 In Tamil it is called thottachinungi and scientifically known as Mimosa pudica. During the weekend travel with family and while stopping somewhere to drink coffee, found this plants on road side and had some fun touching its leaves to closing. The pongal was really wonderful and we went to our native home and celebrated on the terrace by lighting pongal pot. After long time we cousins met and enjoyed the holidays and as I wish I can’t visit any village on this mattu pongal day and had a bad evening at beach by leaving the vehicle into sand. Dad parked the vehicle near the shore and went to walk, and being a enthusiastic off-road driving, we tried to drive on sand by listening to one of my cousin saying scorpio (SUV) will go on sand and it has huge wheels to balance, we learned a never forget experience and scold from dad by making struck into the sand. It was more than a 45minutes drama of fear and tension until releasing the vehicle from sand and pleasantly lot of people came to help us and it was a hard time for everyone esp. my cousins who tried many ways to pull it out. Pongal, gladly known as farmer’s festival of harvesting and thanksgiving, and also celebrated as Tamil New Year for last couple of years is now here. The yearlong hardworking and tiresome farmers celebrate this day as Pongal and not alone the farmers; almost every Tamils in the world celebrates this festival as thanksgiving to nature. The world celebrates thanksgiving and harvesting day in different names, but the point of view and hope is one, and its nature the heaven. Pongal is also celebrated in other parts of India as Sankranthi - the transition of the Sun into Capricorn on its celestial path. In the basis of sun and moon, our ancestors calculated this day to be celebrated on the first day of Thai moon, which falls almost on January 14 or15, where sun diverts its path towards north after 6 months journey towards south. On this day people hope good things happen to them. The pongal is celebrated for four days by marking bhogi, pongal, mattu pongal and kaanum pongal. 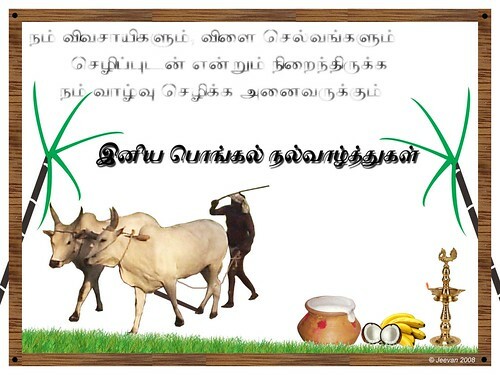 In all these four days, pongal is considered as auspicious and holy day of harvest. On this day, farmers are seen on wealth and set to begin there auspicious affair and hope it continue throughout the month and year. I am on treatment for a month long now to get cure the mucus clot in chest and there’re months to go still to get dissolve the clot. But now it seems like no more a matter except swallowing 8 tablets per day and again it was my mind that struggles to get clear unnecessary thoughts. I am trying hard to come out of some thoughts, but still I’m being touch with it in some ways. I’m going through some symptoms lately and now, though they aren’t certainly to be serious and pass like clouds, still somehow I worry in a force. I just want to blog and be active here alike back and sit before the computer, but nothing comes to mind and couldn’t get interest to read or write, and so I move away. At least I just want to post some pictures, but even that could not be done. I’m much worry these days will I lose my ability to be here and I forced a lot myself now to write something here. In between last week a black bug or beetle went inside my ear bud at mid 2.30 am! I sense like a bug goes inside the ear and before I wake up my dad it went inside and began to buzz or grind, which makes me annoy a lot. We put slide, buds to throw it out, but it refused to come out and kept buzzing inside and besides creating pain and irritation. Don’t know what to do and the pain was heavy, so decided to go to the near by hospital and checking out couple of hospitals with no doctors and almost closed, the other one was opened with a sleeping doctor. Since it was a 24 hours hospital, the doctor waked up from his sleep and attended my ear. Putting me lay on the cot and switching on the focus light, he tried with small scissors to bring it out and being aware about the bud tone and a non-ENT, he at last tried by splashing water inside the bud and the bug slowly came out and my bro standing beside suddenly take it out.